Last week we formalized things with Lasse Shelde, Manager at Bicycle Innovation Lab. From now on we'll be working on the project every Tuesday. So, today was our first day at the Lab. We spent the morning scrutinizing the 3D-model. Conclusion was that the overall frame seems solid and ready for a full scale test. The upper part of the frame, including the seat-post and the steering would probably work with a bit of adjustment, but we don't think it looks quite right yet. Then there's the front hub. We have a basic concept which seems good. The details of how to actually build it are still pretty foggy, but we're optimistic. 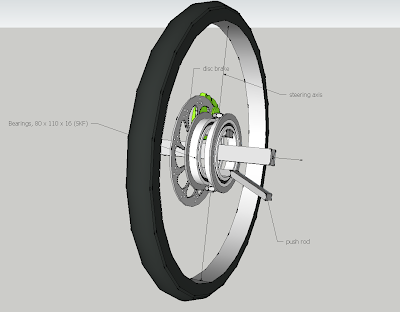 Our current concept for a double axis in-hub steering mechanism with disc brake. We'll explain it properly in a future post. As explained earlier we owe a lot to the 1921 Ner-a-car when it comes to the hub. After poking at the model for a while, we got on our bikes and headed for the Lab, paying a visit to N55 on the way. One of the space frame bikes was parked outside. After having worked on the 3D-model for a while, it was nice and reassuring getting hands on with a similar bike. The N55 workshop is always an interesting place to visit. These day, they are working on some pretty cool construction methods. We got some tips on where to buy materials, and continued to the Lab. At the Lab we had a meeting with Lasse and did a bit of planning. Our plan for next week is basically to go shopping, so we can start building before christmas. Thanks. And, yes please come visit us on a tuesday! We stopped by N55 last tuesday, and got a tip on which supplier to contact for aluminum square tubes and all other metal parts. So we're going there this coming tuesday.